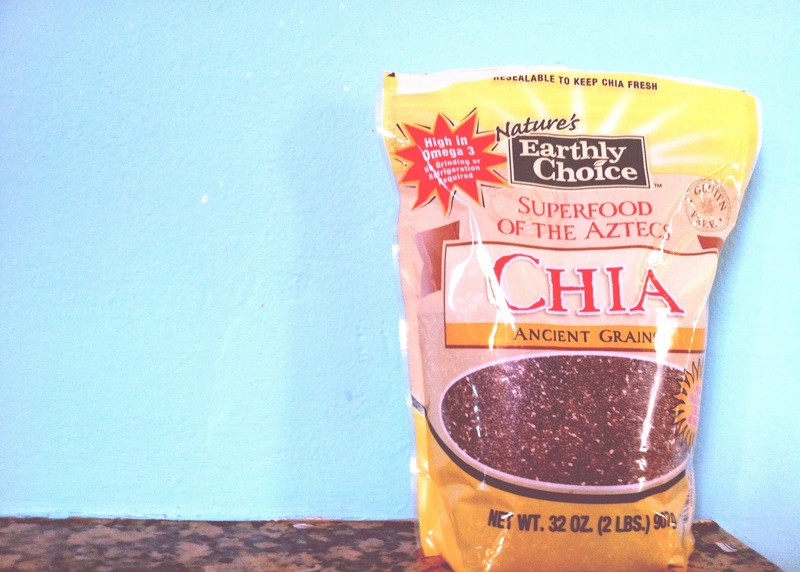 Camp Patton: 7 Quick Takes: Chia Seed Ed. Joining Jen via Hallie for another round of Quick Takes this morn. Today's subject victim is Chia Seed. Get Excited. 1. This is the fourth morning in a row that I've voluntarily forgone my two cups of coffee for a Chia seed smoothie. I'm sure it is merely the power of suggestion but I feel ~1/2 as peppy as the Energizer Bunny as opposed to my usual ~1/3 pep level. Miracle. Or, again, power of suggestion. I buy into things very easily. 2. I wish I were more of a health nut (and an exercise nut and a prayer nut and a discipline nut and a beauty regimen nut) than I actually am but Simon brought these home from Costco after reading, "Born to Run" in order to make the 'natural Redbull' (which he did and I found to be absolutely disgusting). 3. I saw that Haley had posted a Chia Seed Pudding recipe so I decided to turn to the Google and seek out the benefits of 'the Superfood of the Aztecs' and was overwhelmed by all of the magic the seed had the potential to perform. So I made and inhaled the pudding with more almond milk than the recipe calls for so that it might be in the more convenient sip form. It was/is delicious and I can't help but feel like a bonafide health almond whilst enjoying my new coffee/breakfast/seedslop. 4. And then I saw that Kate had posted about Chia Seed and I was absolutely sold. Kate teaches English at the college level and is therefore a genius and could never, ever steer me in any sort of not brilliant direkch. 5. A quick search of the Google will tell you that once emerged in any sort of liquid, the seeds will kind of 'gel' which sounds and is kind of gross. But once I school you in some of the benefits reaped by the gross gel, you will soon get over the consistency. I think. I hope. 6. Another quick search of the Google will tell you everything and more that I'm about to type. So, don't quote me .. quote your search engine. 7. And search!!! lose weight without starving (yes, please pesky postpartum clingers), balance blood sugar (don't mind if I do), feel more energized (check), bake with less fat (tried this with pizza crust and I wasn't a fan ... can't win them all), add age-defying antioxidants (surely), cut food cravings (won't believe till I see), glossier hair (don't care but won't fight it) and it is reportedly 'better' than the health king Flax seed. Of course, there are many more but these are the ones that I was able to plagiarize fastest. My Husband and I read Born to Run and that's how we learned about the Chia seed and we LOVE IT!!! I find the biggest thing is does for me is it helps me to stay hydrated longer, I love that! You've got be going all health nutty over here! Is it cheap---ish? Well...I'm glad you're chia-ing at Camp Patton. It makes me feel decidedly cooler. We make chia pudding with coconut milk (and a little sugar, vanilla, and cinnamon.) That way it's nice and fatty. You probably know this, but fat is way in right now. Good to know! We use flax seed quite a bit and I guess folks consider me a health nut. (I just want to feel good!) I'll have to try chia seed! Thanks for the tip! i'm sorry ... i read chia and immediately thought chia pets. yay! did the recipe from my site not work though? sad they didn't "gel" for you lol. hope you got it working correctly this time! i need a change. i'm frazzled and stressed-and going to purchase these tongiht. thank you.